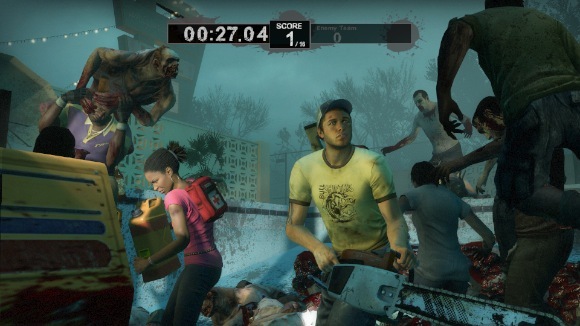 Valve has announced a new competitive gameplay mode in Left 4 Dead 2 called Scavenge. Played like a quick round of versus against a clock, the team of four survivors must collect gas canisters to fill up a generator. For every canister filled the team gets 20 seconds of added time and a point. The other team of special infected must stop them from scoring as many points as they can, as once time runs out, the sides switch. Each of the game's campaigns has a unique scavenge map associated with it. Total matches are done in a best 2 out of 3 in three round sets. The video below shows a bit of the gameplay. Also unveiled is a new difficulty called "Realism" for only the most intense players. "Take Portal for example: We had our best internal players who could blow through that game in about 30 minutes, but within weeks of launching it we had people on YouTube beating [the testers'] times by 10 minutes or more. Realism is for those players." Anybody ready to try? Sounds like only the best of the best co-op teams will be able to survive it. Page created in 0.2584 seconds.